What a brilliant article on running vSphere on the NUC. I’m going down the idea ot of clustering two of these boxes also. I’m going to advertise your testing and config within a Facebook group ive created for all things NUC. Please check it out! Hey, I am just about to press “go” to purchase one of these units, but I can’t work out what I need to be able to add an SSD to this. I presume I need something to use one of the Mini PCIe slots, but what? This post has been a revelation by the way… THANKS! Personally I just boot from a £5 USB stick, as my VMs run on shared storage from my NAS. Hi, yep… I had eventually figured it out myself… but to be honest, my show-stopper issue with the NUC is on the networking side. Out of the box, the only way that I can see to add an additional NIC is by using a mini pci-e wireless card, and I didn’t have the confidence that esxi would play nicely with that. In the end I’ve decided to do a proper upgrade of my full-sized lab box…. but I might look at these again in future as I love the idea of a vSphere box in such a tiny package. Alex, I really like your articles on the NUC. Thank you for providing such a great resource for those looking create a similar lab environment. You basically have my dream for a home lab; 2 small low-power hosts, NAS, managed swtich, etc. Unfortunately, I don’t have the budget for all of it right now. 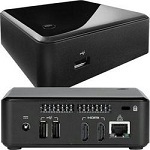 I’m looking to build one NUC system, use a 256Gb SSD for local storage/VM data store and back it up to a USB harddrive until I can get a proper shared storage solution (NAS+drives). Would this work, provided I understand I wouldn’t get to play with the cool clustering features? Any advice you could provide would be most appreciated. Thank you and keep up the great work here. I don’t see why it wouldn’t work. The SSD would need to be a mini-PCI one unless you plan to access it via USB (I havent actually tested if VMFS is possible on a USB disk, but would give some interesting storage expansion options!). You could also practice clustering by nesting VMs if you were really keen (vInception style), meaning you would have ESXi running 2 copies of ESXi, which then run your VMs! This is also achievable using VMware workstation on any normal machine too (with enough RAM). Thank you for the info. Glad to know that I can still play with only 1 host, even it did turn into vInception, :). How many VMs are you able to run with the NUC? Also are you running any CPU heavy services like Exchange? I’m not running anything heavy at the moment, but having run enough 2008 R2 VMs to pretty much max out the 32 GB RAM across the two nodes, my CPU still only averages <1Ghz across the whole cluster, as its just a test lab so mostly idle. Looking into the USB side of things, as I understand it you cant directly mount USB disks to ESXi, all you can do is pass them through to VMs, which is a shame! I have not been able to customize an ESXi 5.1 ISO to include the E1001 driver. Has anyone built such an ISO they might be willing to share via Dropbox or similar, or have instructions that work for ESXi 5.1? Hoping to use this little microbox I just received as part of my test lab. I’m not sure this can be done legally as I doubt VMware would want people distributing their software from third party sites (never mind the security implications). What seems to be the issue? Is it an NUC you’re using? I did ultimately get the NUC booted on ESXi 5.1.0 and apply the patches that are available. So far it’s not working overly well. I find the system hangs when there is heavy activity, but I haven’t determined the source of the hang yet. Trying to do a Storage vMotion of a VM, whether that VM is running or not, usually hangs the system. That could be due to network, disk or other. Overall, it looks like the NUC has some issues. I’m not sure of BIOS versions or if there are fixes to BIOS that might affect what I’m seeing. So far, the NUC is a lot less useful in my lab setup than I’d hoped. Good to hear that you got it working! I did a bunch of SvMs when I first got my setup configured and didn’t have any issues at all. Have had just one hang in the 3 months since I bought mine which was a few days ago. The chassis do get quite warm when in operation, do you have the NUC in a reasonably uncluttered area to allow the heat to radiate away? Let us know how you get on! Thanks a lot!! I was stuck in the multiboot bug. The solution was ridiculously simple too, use the hdmi1 port of the TV and everything worked! 4th Gen i3 brix or NUC. create a VM for nexentastor of freenas and run that either from another USB or mSATA configuring passthrough to the external drive. create more VM’s and storing them on nexentastor or freenas (external drive). My worry is performance. How well would this perform? I’m trying to avoid buying a proper NAS at this stage, but if performance is going to be horrible then I think I don’t have any other options. I think it will work ok, very similar to the way that a vInception setup works. The only thing is making sure of your dependencies as what happens if you lose power? You need to ensure your storage VM comes up first and can see the USB passthrough (assuming USB passthrough to the VM works) or the mSata storage. Another option (depending how many nodes you have) could be getting the larger case version which takes sata drives. You can then either use them as local storage or even better, run VSAN! Have you had any encounters getting an Apple Thunderbolt ethernet adaptor working with a NUC and ESXi? I’m aware of the obvious result from Google but they’re not working for me (hanging on the “Loading Installer” screen) and I was wondering if you’d had any different experience. Hey Greg, not tried the thunderbolt adapters myself. Would love to know if anyone has had any luck with them though?